Detroit assembly line will quadruple plug-in production, add Chevy Malibu and Impala models. 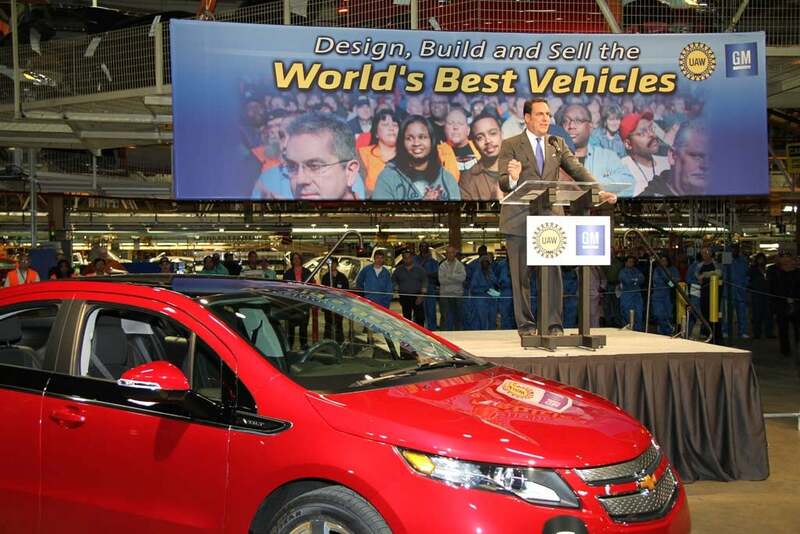 GM's North American President Mark Reuss at the Poletown plant announcing 2,500 new jobs. Following up on an earlier announcement that it would invest $2 billion in 17 U.S. plants, General Motors today provided additional details confirming it will add 2,500 jobs at the Detroit plant producing the well-publicized Chevrolet Volt plug-in hybrid. Known as the “Poletown” plant, the factory will add a second shift later this year and is expected to introduce a third shift later on as it takes on several additional product lines. Among other things, the factory is beginning to roll out a European version of the Volt, called Opel Ampera, which GM believes will increase demand enough to support the production of 60,000 plug-ins next year – about four times more than it expects to produce in 2011. 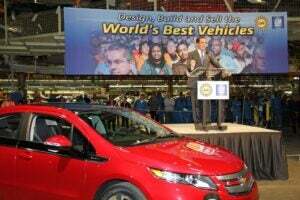 In all, GM expects to invest $69 million in the facility, formally called the Detroit-Hamtramck Assembly Plant. The 26-year-old facility will shift from its traditional focus on luxury cars, such as the Cadillac DTS sedan, and is now expected to become one of the higher-volume assembly lines in the maker’s global production network. “We’re doing (this) because we’re confident of consumer demand,” said Mark Reuss, president of GM’s North American operations, during a ceremony at the facility. The burst of activity that will eventually lead to more than $4 billion of investments and the creation of 9,000 jobs comes less than two years after General Motors emerged from bankruptcy. Despite abandoning four of its eight U.S. brands, the maker has been steadily gaining momentum – translating into improved sales, market share and profitability. In fact, GM is expected by many analysts to regain its position as the world’s best-selling automaker this year – though that has a lot to do with the impact of the March 11 disaster in Japan that briefly shut down the Japanese auto industry and will eventually cost industry giant Toyota 100s of thousands of units of lost production. “It doesn’t feel very good to be gifted by things like (the disaster),” said Reuss, following the Wednesday ceremonies. “We want to earn anything we get.” But the executive noted that even before March 11 GM was gaining ground while rival Toyota was struggling. Perhaps the maker’s biggest challenge, analysts warn, is that its product pipeline was impacted by the Chapter 11 filing, which means there could be a shortage of new offerings over the next year or so, something CEO Dan Akerson acknowledged this past January. But the GM chief also said he was pressing his product development team to speed up their efforts, something that was hinted at during the Wednesday events at the Poletown plant. The timing of the launch of the next-generation Malibu was “picked up,” Reuss said, while it is believed GM also hopes to take months off the development time of the next Impala – though the North American president declined to discuss specific details. With many potential customers waiting with cash in hand, CEO Akerson has also been pressing to expand production of the Volt and its sister plug-in, the Ampera. The maker has been taking a cautious approach, in part, hoping to ensure it doesn’t run into technical glitches – as rival Nissan did when it experienced a restart issue on a small number of Leaf battery cars. This entry was posted on Wednesday, May 25th, 2011 at and is filed under Automobiles. You can follow any responses to this entry through the RSS 2.0 feed. Both comments and pings are currently closed.